Domestic Cat (Felis catus) is a cat that often mingles with humans. Meanwhile, the wildcat (Felis chaus) is a type of cat that lives in the wild, especially in forest areas. Wildcat is one of the protected cat species because they are jeopardized. The increasing deforestation and poaching triggered this condition. Nevertheless, these cats can be found in scientific research centers or zoos. A wildcat, of course, can only be maintained by licensing the authorities. So, here are some of the world-famous types of wildcats. Known as Asian Leopard, this wildcat is included in the Bengalensis species. In Indonesia—which is one of the origins of this cat—Asian Leopard is also often called Blacan. This type of cat is usually used as a brood to mate with the American Cat Shorthair. The aim is to breed the Bengal Cat species. If you see them, the physical characteristics of Asian Leopard are very similar to Bengal cats. This cat usually preys on small animals such as lizard, bird, amphibian, mice, and insect. This wildcat has a flat head shape. Having small earlobes, their eyeballs are very large; when seen, as if it doesn't have pupils. The cat's nose is sharp as well. 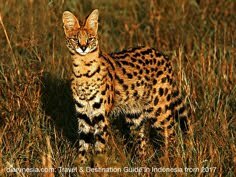 This type of wildcat is endemic in Southeast Asia, especially spread on the Malay Peninsula, Thailand, Borneo, and Andalas Island (Sumatra). This cat included in the Prionailurus planiceps species and live wild in nature. Flat-headed cat likes to eat frog, fish, and crustaceans too because they are very good at diving. In some countries, a Marbled cat has been included in the list of protected animals. This cat belongs to the Pardofelis marmorata species. Marbled cat is on the red list of endangered animals nowadays, because of its estimated number of only 10,000 in the world. This cat itself has native habitat in Southeast Asia and South Asia. The main prey of Marbled cat is reptile, bird, squirrel, rodent, and frog. Since long ago, researchers tried to keep an eye on the movements of this wildcat. Unfortunately, this cat is a nocturnal animal (very active at night). Surely, it makes their search more difficult. This type of cat is also included in the list of vulnerable species by the International Union for Conservation of Nature and Natural Resources (IUCN). The Asian golden cat has the scientific name Pardofelis temminckii. This cat is often called the Temminck cat. Asian golden cat is found in the Southeast Asia region, mainly in Tibet, Bhutan, Nepal, India, Bangladesh, Myanmar, Vietnam, Thailand, Cambodia, Laos, South China to Malaysia, and Indonesia. These cats like to prey on birds, small reptiles, small ungulates, rodents, amphibians, and insects. Asian golden cat likes forest habitats which have rocky areas. Therefore, this type of cat is often found in the area of a green tropical rainforest or dry deciduous. The name of the Asian Golden Cat is taken from Coenraad Jacob Temminck, a Dutch zoologist. In 1827, he was the first person who explained about the African golden cat; it became a close relative of the Asian golden cat. The leopard cat is included in the species Prionailurus bengalensis. This type of wildcat has spots on its body that look like leopards. That's why this cat is often called Leopard cat. Leopard cat comes from East and South Asia. In 2002, IUCN included this cat in the list of low-risk species. Even so, they remain threatened with extinction due to the rampant poaching and habitat loss. This cat size is also smaller compared to other wildcats. Leopard cat has the same size as domestic cats, but their legs are slimmer. The membranes on the toes also appear more clearly. This cat has a small head which is marked with two dark lines. They also have white and short snouts and likes to eat small animals including mice, rodent, lizard, amphibian, bird, and insect. Iberian Lynx is a very rare type of wildcat. Their existence is threatened with extinction now. This cat comes from the Iberian Peninsula in Southern Europe. Iberian Lynx usually lives in the mountain and forested area. They like to eat European rabbits. Unfortunately, their main prey has been destroyed by disease, and it has influenced this wildcat's diet. Therefore, this type of cat is now bred in conservation to prevent its extinction. Wildcats should not be kept as a pet; their wild instinct makes it unsafe to be kept as a domestic cat. Besides that, keeping a wildcat can be subject to criminal penalties because many countries have banned wildcat as a pet especially with their endangered status.